Ring in the sound of the holidays this season with crocheted Christmas bell ornaments. These easy patterns are quick to stitch for both an experienced pro and a novice crocheter. You can crochet both bell patterns in an hour or two. 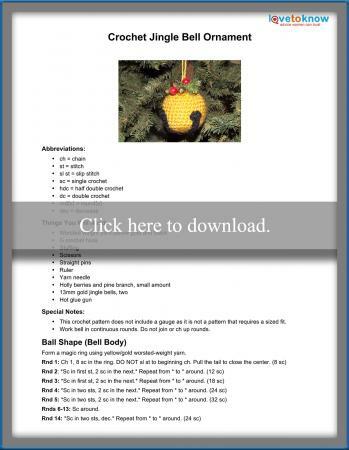 Choose your bell then click on the pattern image to download and print the instructions. You can find additional help with downloading and printing the patterns by using this handy guide. These adorable bells are reminiscent of metal jingle bells. If silver bells are more to your liking, simply use gray yarn for the main color. Finished size is 2 1/2" in diameter. Many crochet bell ornaments use tiny hooks and crochet thread, which can be intimidating for new crocheters. This bell pattern, however, uses yarn and a bigger hook that allows you to work up a beautiful dome bell no matter what your crochet experience. 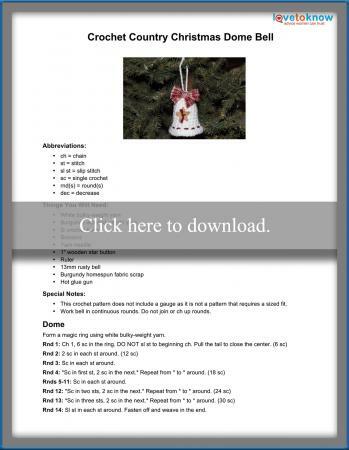 Create crocheted Christmas bells that reflect your personal preferences. The following are a few tips and ideas to help you with choices and substitutions. If a wooden star button is not readily available for the dome bell, make your own by drilling button holes through a wooden craft star. Give your dome bell a bit of vintage charm by changing out the wooden star for a beautiful old button from Grandma's button box. Size variations for either bell can easily be made by using thicker or thinner yarn and bigger or smaller hooks. Don't let the colors used in these patterns limit your creativity. Choose yarn colors that enhance your personal Christmas decor. Make several bells to decorate a table-top tree or a welcoming door wreath. Preparing for holiday craft shows is a year-round endeavor, and ornaments are a must-have offering for potential holiday shoppers. Fill a basket with yarn to crochet quick ornaments while watching television any time of the year.